Paper presented ‘Study of beta 2 microglobulin levels in patients of chronic renal failure and effects of different dialyzing membranes on the levels of beta 2 microglobulin’ at the conference of ISN, Calcutta, 1997. Paper presented ‘Is standard PET the only option for peritoneal membrane characteristics’ at the conference of Peritoneal Dialysis Society of India, New Delhi, 2001. Paper presented ‘Determination of PET using a radiopharmaceutical’ at the conference of Indian Society of Nephrology, Lucknow 2001. Paper presented ‘Effect of Alendronate on post renal transplant osteoporosis: A Randomized Study’ at ISOT, Hyderabad, 2003. Bansal award Oration at ISN, Pune, 2008. Paper presented “Icodextrin alone is reasonable option for initiation of peritoneal dialysis” at International Society of Peritoneal Dialysis, Mexico, 2010. 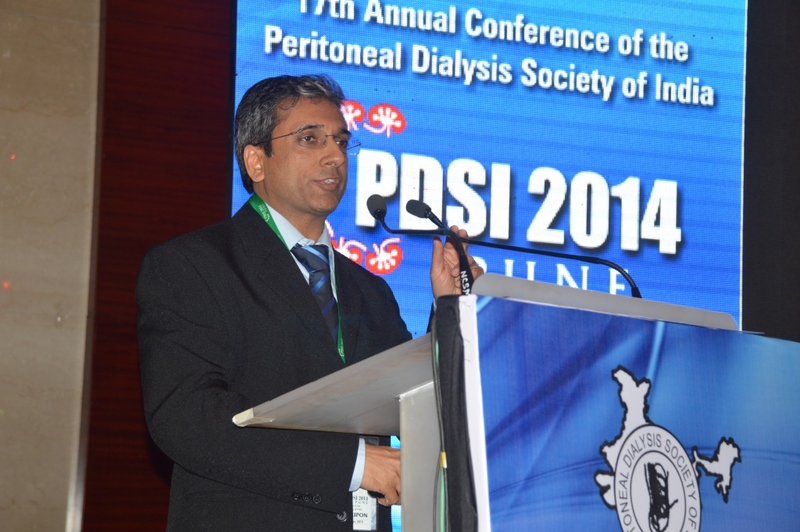 Paper presented ‘Survival of elderly hemodialysis and peritoneal dialysis patients is similar’ at PDSI 2014, Pune. Invited lecture on “Icodextrin – Fluid balance and beyond” at ISN, Guwahati, 2009. Invited Lecture on “PD in 2010 – Technological advances in PD” at Peritoneal Dialysis Society of India, Bangalore, 2010. Invited Lecture on ‘Hyponatremia and role of Vaptans’ at TASK Switzerland, 2010. Invited Lecture on ‘Nephro Facts – Basics of Kidney at Nephrology Simplified 2010 at Mumbai, 2010. Invited Lecture on ‘Icodextrin – indications and usage’ and ‘PD prescriptions’ in PD Care weekend held at Hyderabad on 11-12 Jun 2011. Invited Lecture on “Review of Peritonitis check list” in PD college held at St John’s, Bangalore on 6-7 August 2011. Invited lecture on “Icodextrin: Review” in PD college held at St John’s, Bangalore on 6-7 Aug 2011. Invited lecture on ‘Icodextrin in developing world’ in PDSI 2011 at Chennai on 1-2 Oct 2011. Invited lecture on ‘Economics and Prospects of PD in India’ in PDSI 2011 at Chennai on 1-2 Oct 2011. Invited lecture on ‘genitourinary tuberculosis’ at Nephrology Simplified 2011 at Mumbai, 2011. Invited lecture on ‘Acute PD in AKI in ICU setting’ at CRITICARE work shop, Critical care conference in Pune, Feb 2012. Invited lecture on ‘Resistance to erythropoeisis simulating agents in CKD’ at Mahabaleshwar, May 2012. Invited lecture on ‘Dialysis modality selection in stage 5 CKD patients’ at Consensus meeting on peritoneal dialysis at St John’s, Bangalore, May 2012. Invited Lecture on ‘Peritoneal Dialysis’ at COREP, held in Mumbai June 2012. Invited lecture on ‘key players in urine formation’ at Nephrology Simplified 2012 at Mumbai, Dec 2012. Invited lecture on ‘evidence based management of electrolyte abnormalities’ at Nashik Jan 2013. Invited Lecture on ‘How to manage Ultrafiltration in PD patients’ at West Zone Nephrology conference Sept 19 – 21, 2013, Rajkot. Invited lecture on ‘Biologic Basis: the unlikely nexus between renal physiology and gut microbiome’ at ISN 2014 Dec 18 - 21at Kolkatta. Invited lecture on ‘CAPD for Indian patients – Is it a viable option?’ at APICON 2015 at Gurgaon. Invited lecture on ‘Peritoneal Dialysis for Cardiac failure’ at ApEx 2015 at Mumbai. Invited lecture on ‘Interpreting the Adequest’ at ApEx 2015 at Mumbai. Invited as Quiz Master in PDSI 2015 at PGI, Chandigarh. Poster presented ‘Nutritional assessment of patients on hemodialysis by anthropometric measurements’ at the ISNCON, Jaipur, 2002. Poster presented ‘Role of Alendronate in post renal transplant osteoporosis – A Randomized Study’ at the ISNCON, Jaipur, 2002. Poster presented ‘Post Transplant cystocele induced vesicoureteric reflux in a native kidney:A Case Report’ at the ISNCON, Visakhapatnam, 2003. Poster presented ‘Sirolimus induced Pneumonitis / Non cardiogenic Pulmonary Edema’ at the ISNCON, Visakhapatnam, 2003. Poster presented “Predictors of post transplant cardio-vascular events” at the ASN, Philadelphia, USA, 2005. Poster presented “What could be the expected solute clearance with single exchange of icodextrin?” at PDSI 2014, Pune. Dr. Tarun K. Jeloka is currently working as a Sr. Consultant & Assoc.Director(Nephrology)at Aditya Birla Memorial Hospital, Pune. Pune Care of Kidney Diseases, Pimple Saudagar, Pune.